The English text concerning the conversation has been the necessary starting point for the Swedish version. As the work has been done during some shortage of time, minor divergences in the English text can be found. And tell us how you learned to tell a story, and write it? Was it important that the story would be told from a woman’s perspective? I never thought of it being important, but I never thought of myself as being anything but a woman, and there were many good stories about little girls and women. After you got maybe into your teens it was more about helping the man to achieve his needs and so on, but when I was a young girl I had no feeling of inferiority at all about being a woman. And this may have been because I lived in a part of Ontario where women did most of the reading, telling most of the stories, the men were outside doing important things, they didn’t go in for stories. So I felt quite at home. How did that environment inspire you? You know, I don’t think that I needed any inspiration, I thought that stories were so important in the world, and I wanted to make up some of these stories, I wanted to keep on doing this, and it didn’t have to do with other people, I didn’t need to tell anybody, and it wasn’t until much later that I realized that it would be interesting if one got them into a larger audience. What is important to you when you tell a story? Well, obviously, in those early days the important thing was the happy ending, I did not tolerate unhappy endings, for my heroines anyway. And later on I began to read things like Wuthering Heights, and very very unhappy endings would take place, so I changed my ideas completely and went in for the tragic, which I enjoyed. What can be so interesting in describing small town Canadian life? You just have to be there. I think any life can be interesting, any surroundings can be interesting, I don’t think I could have been so brave if I had been living in a town, competing with people on what can be called a generally higher cultural level. I didn’t have to cope with that. I was the only person I knew who wrote stories, though I didn’t tell them to anybody, and as far as I knew, at least for a while, I was the only person who could do this in the world. Were you always that confident in your writing? I was for a long time, but I became very unconfident when I grew up and met a few other people who were writing. Then I realized that the job was a bit harder than I had expected. But I never gave up at all, it was just something I did. When you start a story, do you always have it plotted out? I do, but then it often changes. I start with a plot, and I work at it, and then I see that it goes another way and things happen as I’m writing the story, but at least I have to start out with a fairly clear idea of what the story is about. How consumed are you by the story when you start writing? Oh, desperately. But you know, I always got lunch for my children, did I not? I was a housewife, so I learned to write in times off, and I don’t think I ever gave it up, though there were times when I was very discouraged, because I began to see that the stories I was writing were not very good, that I had a lot to learn and that it was a much, much harder job than I had expected. But I didn’t stop, I don’t think I have ever done that. What part is hardest when you want to tell a story? I think probably that part when you go over the story and realize how bad it is. You know, the first part, excitement, the second, pretty good, but then you pick it up one morning and you think “what nonsense”, and that is when you really have to get to work on it. And for me it always seemed the right thing to do, it was my fault if the story was bad, not the story’s fault. But how do you turn it around if you are not satisfied? Hard work. But I try to think of a better way to explain. You have characters that you haven’t given a chance, and you have to think about them or do something quite different with them. In my earlier days I was prone to a lot of flowery prose, and I gradually learned to take a lot of that out. So you just go on thinking about it and finding out more and more what the story was about, which you thought you understood in the beginning, but you actually had a lot more to learn. How many stories have you thrown away? Ha, when I was young I threw them all away. I have no idea, but I haven’t done that so often in recent years, I generally knew what I had to do to make them live. But there may still always be a mistake somewhere that I realize is a mistake and you just have to forget about it. Do you ever regret throwing a story away? I don’t think so, because by then I have gone through enough agony about it, knowing that it didn’t work from the beginning. But as I say that doesn’t happen very often. Growing older, how does that change your writing? Oh, well, in a very predictable way. You start out writing about beautiful young princesses and then you write about housewives and children and later on about old women, and this just goes on, without your necessarily trying to do anything to change that. Your vision changes. Do you think you have been important to other female writers, being a housewife, being able to combine household work with writing? I actually don’t know about that, I would hope that I have been. I think I went to other female writers when I was young, and that was a great encouragement to me, but whether I have been important to others I don’t know. I think women have a much, I wouldn’t say easier time, but it’s much more okay now for women to be doing something important, not just fooling around with a little game that she does while everybody else is out of the house, but to be really serious about writing, as a man would write. Who do you think you are? What has that expression meant to you? Well, I grew up in the countryside, I grew up with people who were generally Scotch-Irish, and it was a very common idea not to try too much, never to think you were smart. That was another image that was popular, “Ah, you think you are smart.” And to do anything like writing you’d have to think you were smart, for quite a while, but I was just a peculiar person. Were you an early feminist? I never knew about the word “feminism”, but of course I was a feminist, because I actually grew up in a part of Canada where women could write more easily than men. The big, important writers would be men, but knowing that a woman wrote stories was probably less to her discredit than if a man wrote stories. Because it was not a man’s occupation. Well, that was very much in my youth, it’s not that way at all now. Would it have changed your writing if you had finished your university studies? It might have indeed, it might have made me a lot more cautious and a lot more scared about being a writer, because the more I knew about what people had done, I was naturally rather daunted. I would perhaps have thought I couldn’t do it, but I don’t think it would have happened, really, maybe for a while, but then, I wanted to write so much that I would just have gone ahead and tried it anyway. Was the writing a gift, given to you? I don’t think the people around me would have thought that, but I never thought about it as a gift, I just thought that it was something that I could do, if I just tried hard enough. So if it was a gift, it certainly wasn’t an easy gift, not after The Little Mermaid. Did you ever hesitate, did you ever think that you were not good enough? All the time, all the time! I threw out more stuff than I ever sent away or finished, and that went on all through my twenties something. But I was still learning to write the way I wanted to write. So, no, it wasn’t an easy thing. Oh, my feelings about my mother were very complicated, because she was sick, she had Parkinson’s disease, she needed a lot of help, and her speech was difficult, people couldn’t tell what she was saying, and yet she was a very gregarious person, who wanted very much to be part of a social life, and of course that wasn’t possible for her because of her speech problems. So I was embarrassed by her, I loved her but in a way perhaps didn’t want to be identified with her, I didn’t want to stand out and say the things she wanted me to say to people, it was difficult in the same way that any adolescent would think of a person or a parent who was maimed in some respect. You would want that time to be totally free of such things. Did she inspire you in any way? I think she probably did but not in ways I could notice or understand. I can’t remember when I wasn’t writing stories, I mean, I didn’t write them down, but I told them, not to her, to anybody. But the fact that she read, and my father read too … My mother, I think, would have been more agreeable to someone who wanted to be a writer. She would have thought that was an admirable thing to be, but the people around me didn’t know that I wanted to be a writer, cause I didn’t let them find out, it would have seemed to most people ridiculous. Because most people I knew didn’t read, they took to life in a very practical way and my whole idea of life had to be rather sheltered from people I knew. Has it been hard to tell a true story from a woman’s perspective? No, not at all, because that’s the way I think, being a woman and all, and it never bothered me. You know this is kind of a special thing with growing up as I did, if anybody read, it was the women, if anybody had the education it was often the woman; it would have been a school teacher or something like that, and far from being closed to women, the world of reading and writing was widely more open to women than it was to men, men being farmers or doing different kinds of work. And you were brought up in a working class home? And that’s where your stories start as well? Yes. I didn’t realize it was a working class home, I just looked at where I was and wrote about it. And did you like the fact always to write at specific times, looking at a schedule, taking care of the kids, cooking dinner? Well, I wrote whenever I could, and my first husband was very helpful, to him writing was an admirable thing to do. He didn’t think of it as something that a woman couldn’t do, as many of the men that I met later did, he took it as something that he wanted me to do and never wavered from that. It was great fun in the first place, because we moved in here, determined to open a bookstore, and everybody thought we were crazy and would starve to death, but we didn’t. We worked very hard. How important was the bookstore in the beginning for the two of you, when it all started? It was our livelihood. It was all we had. We didn’t have any other source of income. The first day when we opened we made 175 dollars. – Which you thought was a lot. Well, it was, cause it took us a long time to get back to that again. I used to sit behind the desk and find the books for people and handle all the things you do in a bookstore, generally just by myself, and people came in and talked about books a lot, it was very much a place for people to get together rather than immediately buy things, and this was especially true at night, when I’d be sitting here by myself, and I had these people come in every night, talking to me about something, and it was great, it was a lot of fun. Up until this point I had been a housewife, I was at home all the time, I was a writer as well, but this was a wonderful chance to get into the world. I don’t think we made much money, possibly I talked to people a little too much, you know, instead of getting them to the books, but it was a fantastic time in my life. Visitor in the bookstore: Your books remind me of home. – Yes, I live right south of Amsterdam. Thank you so much, goodbye. Think of that! Well, I love it when someone just comes up to you like that, when it’s not only a matter of getting autographs, but of telling you why. Do you want young women to be inspired by your books and feel inspired to write? I don’t care what they feel as long as they enjoy reading the book. I want people to find not so much inspiration as great enjoyment. That’s what I want; I want people to enjoy my books, to think of them as related to their own lives in ways. But that isn’t the major thing. I am trying to say that I am not, I guess I am not a political person. Are you a cultural person? Probably. I am not quite sure what that means, but I think I am. You seem to have a very simple view on things? Well, I read somewhere that you want things to be explained in an easy way. Yes, I do. But I never think that I want to explain things more easily, that’s just the way I write. I think I write naturally in an easy way, without thinking that this was to be made more easy. Have you ever run into periods when you haven’t been able to write? Yes, I have. Well, I gave up writing, when was it, maybe a year ago, but that was a decision, that was not wanting to write and not being able to, a decision that I wanted to behave like the rest of the world. Because when you are writing you are doing something that other people don’t know you are doing, and you can’t really talk about it, you are always finding your way in this secret world, and then you are doing something else in the normal world. And I am sort of getting tired of that, I have done it all my life, absolutely all my life. When I got in company with writers who were in a way more academic, then I became a little flustered, because I knew I couldn’t write that way, I didn’t have that gift. I guess it’s a different way of telling a story? Yes, and I never worked on it in a, what shall I say, conscious way, well, of course I was conscious, I worked in a way that comforted and pleased myself more than in a way that followed some kind of idea. 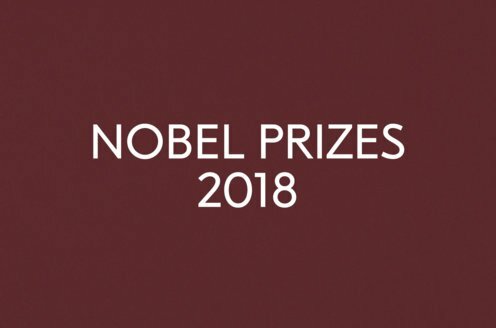 Did you ever see yourself win the Nobel Prize? Oh, no, no! I was a woman! But there are women who have won it, I know. I just love the honour, I love it, but I just didn’t think that way, because most writers probably underestimate their work, especially after it’s done. You don’t go around and tell your friends that I will probably win the Nobel Prize. That is not a common way of greeting one! Do you ever go back these days and read any of your old books? No! No! I am afraid to! No, but then I would probably get a terrific urge to change just a little bit here, a little bit there, and I have even done that in certain copies of my books that I would take out of the cupboard, but then I realize that it doesn’t matter if I change them, because it’s not changed out there. Is there anything you want to say to the people in Stockholm? Oh, I want to say that I am so grateful for this great honour, that nothing, nothing in the world could make me so happy as this! Thank you! In the dining room of the Commercial Hotel, Louisa opened the letter that had arrived that day from overseas. She ate steak and potatoes, her usual meal, and drank a glass of wine. There were a few travellers in the room, and the dentist who ate there every night because he was a widower. He had shown an interest in her in the beginning but had told her he had never before seen a woman touch wine or spirits. “It is for my health,” said Louisa gravely. The white tablecloths were changed every week and in the meantime were protected by oilcloth mats. In winter, the din­ing room smelled of these mats wiped by a kitchen rag, and of coal fumes from the furnace, and beef gravy and dried po­tatoes and onions—a smell not unpleasant to anybody coming in hungry from the cold. On each table was a little cruet stand with the bottle of brown sauce, the bottle of tomato sauce, and the pot of horseradish. The letter was addressed to “The Librarian, Carstairs Public Library, Carstairs, Ontario.” It was dated six weeks before—January 4, 1917. Perhaps you will be surprised to hear from a person you don’t know and that doesn’t remember your name. I hope you are still the same Librarian though enough time has gone by that you could have moved on. What has landed me here in Hospital is not too serious. I see worse all around me and get my mind off of all that by picturing things and wondering for instance if you are still there in the Library. If you are the one I mean, you are about of medium size or perhaps not quite, with light brownish hair. You came a few months before it was time for me to go in the Army following on Miss Tamblyn who had been there since I first became a user aged nine or ten. In her time the books were pretty much every which way, and it was as much as your life was worth to ask her for the least help or anything since she was quite a dragon. Then when you came what a change, it was all put into sections of Fiction and Non-Fiction and History and Travel and you got the magazines arranged in order and put out as soon as they arrived, not left to molder away till everything in them was stale. I felt gratitude but did not know how to say so. Also I wondered what brought you there, you were an educated person. My name is Jack Agnew and my card is in the drawer. The last book I took out was very good—H. G. Wells, Mankind in the Making. My education was to Second Form in High School, then I went into Douds as many did. I didn’t join up right away when I was eighteen so you will not see me as a Brave Man. I am a person tending to have my own ideas always. My only relative in Carstairs, or anyplace, is my father Patrick Agnew. He works for Douds not at the factory but at the house doing the gardening. He is a lone wolf even more than me and goes out to the country fishing every chance he gets. I write him a letter sometimes but I doubt if he reads it. After supper Louisa went up to the Ladies’ Parlor on the second floor, and sat down at the desk to write her reply. I am very glad to hear you appreciated what I did in the Library though it was just the normal organization, nothing special. I am sure you would like to hear news of home, but I am a poor person for the job, being an outsider here. I do talk to people in the Library and in the hotel. The travellers in the hotel mostly talk about how business is (it is brisk if you can get the goods) and a little about sickness, and a lot about the War. There are rumors on rumors and opinions galore, which I’m sure would make you laugh if they didn’t make you angry. I will not bother to write them down because I am sure there is a Censor reading this who would cut my letter to ribbons. You ask how I came here. There is no interesting story. My parents are both dead. My father worked for Eaton’s in Toronto in the Furniture Department, and after his death my mother worked there too in Linens. And I also worked there for a while in Books. Perhaps you could say Eaton’s was our Douds. I graduated from Jarvis Collegiate. I had some sickness which put me in hospital for a long time, but I am quite well now. I had a great deal of time to read and my favorite authors are Thomas Hardy, who is accused of being gloomy but I think is very true to life—and Willa Cather. I just happened to be in this town when I heard the Librarian had died and I thought, perhaps that is the job for me. A good thing your letter reached me today as I am about to be discharged from here and don t know if it would have been sent on to where I am going. I am glad you did not think my letter was too foolish. If you run into my father or anybody you do not need to say anything about the fact we are writing to each other. It is nobody’s business and I know there are plenty of people would laugh at me writing to the Librarian as they did at me going to the Library even, why give them the satisfaction? I am glad to be getting out of here. So much luckier than some I see that will never walk or have their sight and will have to hide themselves away from the world. You asked where did I live in Carstairs. Well, it was not anyplace to be proud of. If you know where Vinegar Hill is and you turned off on Flowers Road it is the last house on the right, yellow paint once upon a time. My father grows potatoes, or did. I used to take them around town with my wagon, and every load I sold got a nickel to keep. You mention favorite authors. At one time I was fond of Zane Grey, but I drifted away from reading fiction stories to reading History or Travel. I sometimes read books away over my head, I know, but I do get something out of them. H. G. Wells I mentioned is one and Robert Ingersoll who writes about religion. They have given me a lot to think about. If you are very religious I hope I have not offended you. I have not cut my hair though I often think about it. I do not know if it is vanity or laziness that prevents me. I am not very religious. I walked up Vinegar Hill and found your house. The potatoes are looking healthy. A police dog disputed with me, is he yours? The weather is getting quite warm. We have had the flood on the river, which I gather is an annual Spring event. The water got into the hotel basement and somehow contaminated our drinking supply so that we were given free beer or ginger ale. But only if we lived or were staying there. You can imagine there were plenty of jokes. I should ask if there is anything that I could send you. I am not in need of anything particular. I get the tobacco and other bits of things the ladies in Carstairs do up for us. I would like to read some books by the authors you have mentioned but I doubt whether I would get the chance here. The other day there was a man died of a heart attack. It was the News of all time. Did you hear about the man who died of a heart attack? That was all you heard about day and night here. Then everybody would laugh which seems hard-hearted but it just seemed so strange. It was not even a hot time so you couldn’t say maybe he was scared. (As a matter of fact he was writing a letter at the time so I had better look out.) Before and after him others have died being shot up or blown up but he is the famous one, to die of a heart attack. Everybody is saying what a long way to come and a lot of expense for the Army to go to, for that. The summer has been so dry the watering tank has been doing the streets every day, trying to lay the dust. The children would dance along behind it. There was also a new thing in town—a cart with a little bell that went along selling ice cream, and the children were pretty attentive to this as well. It was pushed by the man who had an accident at the factory—you know who I mean, though I can’t recall his name. He lost his arm to the elbow. My room at the hotel, being on the third floor, it was like an oven, and I often walked about till after midnight. So did many other people, sometimes in pajamas. It was like a dream. There was still a little water in the river, enough to go out in a rowboat, and the Methodist minister did that on a Sunday in August. He was praying for rain in a public service. But there was a small leak in the boat and the water came in and wet his feet and eventually the boat sank and left him standing in the water, which did not nearly reach his waist. Was it an accident or a malicious trick? The talk was all that his prayers were answered but from the wrong direction. I often pass the Douds’ place on my walks. Your father keeps the lawns and hedges looking beautiful. I like the house, so original and airy-looking. But it may not have been cool even there, because I heard the voice of the mother and baby daughter late at night as if they were out on the lawn. Though I told you there is nothing I need, there is one thing I would like. That is a photograph of you. I hope you will not think I am overstepping the bounds to ask for it. Maybe you are engaged to somebody or have a sweetheart over here you are writing to as well as me. You are a cut above the ordinary and it would not surprise me if some Officer had spoken for you. But now that I have asked I cannot take it back and will just leave it up to you to think what you like of me. Louisa was twenty-five years old and had been in love once, with a doctor she had known in the sanitorium. Her love was returned, eventually, costing the doctor his job. There was some harsh doubt in her mind about whether he had been told to leave the sanitorium or had left of his own accord, being weary of the entanglement. He was married, he had children. Letters had played a part that time, too. After he left, they were still writing to one another. And once or twice after she was released. Then she asked him not to write anymore and he didn’t. But the failure of his letters to arrive drove her out of Toronto and made her take the travelling job. Then there would be only the one disappointment in the week, when she got back on Friday or Saturday night. Her last letter had been firm and stoical, and some consciousness of herself as a heroine of love’s tragedy went with her around the country as she hauled her display cases up and down the stairs of small hotels and talked about Paris styles and said that her sample hats were bewitching, and drank her solitary glass of wine. If she’d had anybody to tell, though, she would have laughed at just that notion. She would have said love was all hocus-pocus, a deception, and she believed that. But at the prospect she still felt a hush, a flutter along the nerves, a bowing down of sense, a flagrant prostration. She had a picture taken. She knew how she wanted it to be. She would have liked to wear a simple white blouse, a peasant girl’s smock with the string open at the neck. She did not own a blouse of that description and in fact had only seen them in pictures. And she would have liked to let her hair down. Or if it had to be up, she would have liked it piled very loosely and bound with strings of pearls. Instead she wore her blue silk shirt-waist and bound her hair as usual. She thought the picture made her look rather pale, hollow-eyed. Her expression was sterner and more fore- boding than she had intended. She sent it anyway. I am not engaged, and do not have a sweetheart. I was in love once and it had to be broken off. I was upset at the time but I knew I must bear it, and now I believe that it was all for the best. She had wracked her brains, of course, to remember him. She could not remember shaking out her hair, as he said she had done, or smiling at any young man when the raindrops fell on the radiator. He might as well have dreamed all that, and perhaps he had. She had begun to follow the war in a more detailed way than she had done previously. She did not try to ignore it any-more. She went along the street with a sense that her head was filled with the same exciting and troubling information as everybody else’s. Saint-Quentin, Arras, Montdidier, Amiens, and then there was a battle going on at the Somme River, where surely there had been one before? She laid open on her desk the maps of the war that appeared as double-page spreads in the magazines. She saw in colored lines the German drive to the Marne, the first thrust of the Americans at Château-Thierry. She looked at the artist’s brown pictures of a horse rearing up during an air attack, of some soldiers in East Africa drinking out of coconuts, and of a line of German prisoners with bandaged heads or limbs and bleak, sullen expressions. Now she felt what everybody else did—a constant fear and misgiving and at the same time this addictive excitement. You could look up from your life of the moment and feel the world crackling beyond the walls. I am glad to hear you do not have a sweetheart though I know that is selfish of me. I do not think you and I will ever meet again. I don’t say that because I’ve had a dream about what will happen or am a gloomy person always looking for the worst. It just seems to me it is the most probable thing to happen, though I don’t dwell on it and go along every day doing the best I can to stay alive. I am not trying to worry you or get your sympathy either but just explain how the idea I won’t ever see Carstairs again makes me think I can say anything I want. I guess it’s like being sick with a fever. So I will say I love you. I think of you up on a stool at the Library reaching to put a book away and I come up and put my hands on your waist and lift you down, and you turning around inside my arms as if we agreed about everything. Every Tuesday afternoon the ladies and girls of the Red Cross met in the Council Chambers, which was just down the hall from the Library. When the Library was empty for a few mo­ments, Louisa went down the hall and entered the room full of women. She had decided to knit a scarf. At the sanitorium she had learned how to knit a basic stitch, but she had never learned or had forgotten how to cast on or off. The older women were all busy packing boxes or cutting up and folding bandages from sheets of heavy cotton that were spread on the tables. But a lot of girls near the door were eating buns and drinking tea. One was holding a skein of wool on her arms for another to wind. Louisa told them what she needed to know. “So what do you want to knit, then?” said one of the girls with some bun still in her mouth. Louisa said, a muffler. For a soldier. “Oh, you’ll want the regulation wool,” another said, more politely, and jumped off the table. She came back with some balls of brown wool, and fished a spare pair of needles out of her bag, telling Louisa they could be hers. Other girls gathered around and teased this girl, whose name was Corrie. They told her she was doing it all wrong. “Yes,” said Louisa. Of course they would think of her as an old maid, they would laugh at her or feel sorry for her, according to whatever show they put on, of being kind or brazen. One of the girls in this group was Grace Horne. She was a shy but resolute-looking girl, nineteen years old, with a broad face, thin lips often pressed together, brown hair cut in a straight bang, and an attractively mature body. She had become engaged to Jack Agnew before he went overseas, but they had agreed not to say anything about it. Production: Swedish Educational Broadcasting Company and Swedish Television. Recorded November 12 and 13, 2013, in Canada. © Swedish Academy, Swedish Educational Broadcasting Company and Swedish Television. Excerpt from the short story “Carried Away” reprinted by permission of Alice Munro and Alfred A. Knopf (USA), McClelland & Stewart (Canada), and Chatto & Windus (UK). The interview text may, after December 7, 2013, 5:30 pm (CET), be reprinted for newspaper publication in any language. Any reprint or other use of the short story excerpt is subject to permission by the publishers.